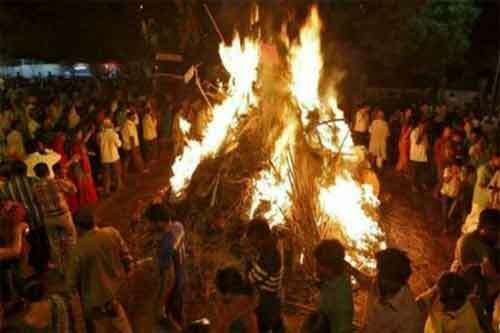 Holika Dahan is the lighting of fire at night during Holi. The story of this ritual is associated demon Holika and child Prahlad, ardent devotee of Vishnu to whose prayers Srihari Vishnu appeared as Narasimha. As per the story, demon king Hiranyakashipu hated Vishnu for killing his brother. He therefore terrorized all this citizens and made them his devotees. All his citizens prayed to Hiranyakashipu and not to Vishnu. But Prahalad, the little son of Hiranyakashipu, prayed to Lord Vishnu. Hiranyakashipu tried all means to stop Prahlad from worshipping Vishnu but he failed. Finally, filled with arrogance and hatred, the father decided to kill his son. But all his attempts failed. Hiranyakashipu had a sister named Holika. She had got a boon that fire will not harm her. Holika’s help was sought and she readily agreed to put an end to Prahlad. She took young Prahalad and sat in a huge cauldron on fire. But this time young Prahalad came out without any damage and Holika was burnt to death. The little boy Prahalad was able to overcome the evil in the form of Holika through his unwavering devotion to Lord Vishnu. In remembrance of this event, people lit bonfire known as Holika Dahan.